Getting your box turtle to eat can sometimes be a challenge. Sometimes a turtle's appetite is hardier than others, and at times it's downright nonexistent. Knowing your box turtle's tastes and eating habits will help you ensure that he's getting the nutrition he needs. 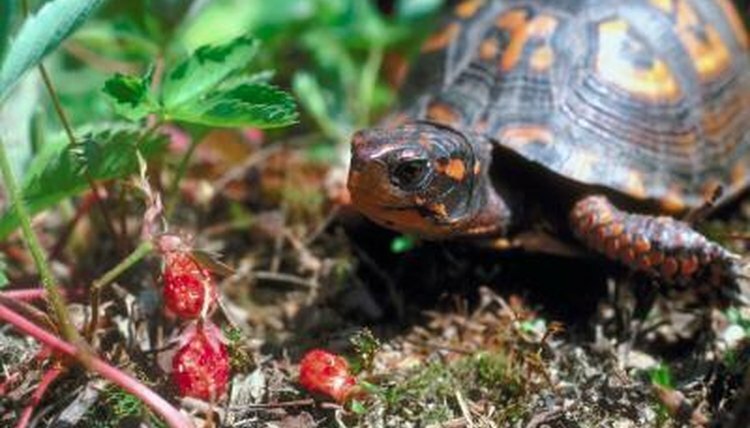 Young box turtles tend to be primarily carnivorous, although turtles at any age are opportunistic eaters and will eat fruits, greens and vegetables if that's what's available. In the wild, they're predators that will eat whatever insects or worms they can catch, and will also eat mushrooms and berries as they come across them. Juvenile pet turtles require a lot of protein and can be fed earthworms, crickets stuffed with greens, and mealworms, along with small amounts of fruit, calcium-rich greens and mixed vegetables. In general, adult turtles are more omnivorous and don't require quite as much protein as younger turtles, although some species, such as the ornate box turtle, still like a lot of meat in their diet. Wild turtles continue to be opportunistic, eating whenever they come across food, and can go days and even weeks at a time without food if none is available. Pet turtles only need to eat every other day or so, and should be offered a wide variety of insects (live if you can stomach that, but canned and dried insects are also fine), fruits, greens and vegetables to ensure that they receive proper nutrition. For domestic turtles, various types of specialized box turtle food is available, including moist canned food and dry pellets. These foods, specially formulated to ensure that the turtle receives proper nutrition, don't need to be supplemented. If you instead feed your turtle a salad of greens, vegetables and bugs, you can crush dry box turtle pellets and dust his food with it to make sure he gets all of his vitamins. Box turtles need plenty of calcium to keep their shells healthy, so in addition to feeding them calcium-rich greens, you can supplement their diet with calcium by either giving them a cuttle bone to chew on, or scraping a small amount of the cuttle bone onto their food. Pet box turtles can be finicky eaters, and sometimes you have to experiment to find foods that they like and will eat consistently. Often, even box turtles that are purchased in a pet store have been wild-caught, and sometimes they'll go on a hunger strike to express their displeasure with captivity. Turtles will also lose their appetites if they're too hot or too cold, and will stop eating for several weeks or even months as they enter a form of hibernation called brumation in the winter. A turtle has to be kept in temperatures lower than 50 degrees Fahrenheit to enter true brumation, so a turtle who isn't hibernating but has stopped eating in the winter might simply need exposure to bright light and a heat lamp to stimulate his appetite. Similarly, turtles who are kept outside during hot summer months will cease eating as they enter aestivation, a form of hibernation that helps them survive extreme heat. Does a Tortoise Have Teeth? Why Do Turtles Eat Pebbles? How Often Do You Feed Pet Turtles?